Prevent weight loss and dehydration by making thorough nutrition assessments and observing mealtime behaviors. Dietitians who work in long term care (LTC) facilities often care for elderly patients with health problems that present special challenges to obtaining the nutrition they need to thrive. One problem in particular is dementia, a general term describing a decrease in mental abilities that affects daily life. Physiological changes associated with aging in general, such as decreased thirst and hunger perception, can further complicate nutrition and hydration status in dementia patients. 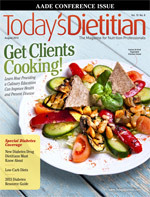 “Along with decreased hunger and thirst, patients may forget to eat and drink, have difficulty expressing food likes and dislikes, be distracted and uninterested during meals, and lose their ability to feed themselves,” says Lara Griffith, MS, RD, a consultant dietitian working in LTC in California. Behaviors associated with dementia, such as pacing and wandering, also can lead to increased energy expenditure and short attention span during meals. A study estimates that almost 30% of dementia patients experience agitation at mealtimes, and nearly 22% resist assistance with meals.2 Given these facts, dietitians should perform thorough assessments of elderly dementia patients when formulating nutrition care plans to uncover any barriers to maintaining nutrition and hydration status. Dining location plays a large role in the amount of food and fluid dementia patients will consume. In LTC, special assistance is offered in certain dining locations to encourage food intake. The level of assistance patients need depends on their self-feeding ability and level of cognition. Those who can consume full meals independently are seated in dining areas where minimal assistance is provided. Patients who need encouragement to eat, guidance to eat safely, and/or help with feeding themselves are placed in settings where supervisory staff is present. It’s characteristic for dementia patients to feed themselves initially but ultimately require help halfway through a meal. RDs always should determine whether a patient’s self-feeding skills are sufficient to eat in a location without assistance and should encourage patients to feed themselves as much as possible. They can enlist occupational therapists to help promote self-feeding and adaptive equipment use. They also can order patients finger foods such as sandwiches, hardboiled eggs, bite-size pieces of fruit, and peanut butter crackers for patients who find it difficult to use a fork or spoon. Griffith also recommends having the same person assist or feed the patient as often as possible. The patient will become familiar with that person and be more accepting of the meal. Weight loss and dehydration often result if the staff provides inadequate help or if the patient responds poorly to the dining atmosphere. Dementia patients who have suffered a stroke or have other health issues often develop difficulty chewing and swallowing. Others may forget what to do with the food once they’ve placed it in their mouths. In these instances, it’s necessary for RDs to give patients verbal cues and remind them to chew and swallow foods and drink liquids and to show them how to do this safely during mealtimes. Patients who aren’t supervised are less likely to eat and drink enough food and fluids, increasing their risk of weight loss, dehydration, and aspiration pneumonia. • loss of food and liquids from the mouth. Any of these signs should prompt dietitians to enlist the help of a speech therapist and note that the patient is at risk of weight loss and dehydration. Making rounds at mealtimes also is a way to determine past and present eating habits and preferences in dementia patients who have had strokes. Since many suffer from aphasia, which ranges from having difficulty remembering words to losing the ability to speak, read, or write, communicating which foods and beverages they do and don’t like can be tough. Meal observation may reveal a patient turning his head or holding his mouth closed when offered certain foods or fluids. This gives dietitians clues about what they like and don’t like. Speaking with family members also can give RDs some insight. If changes in food and beverage consumption do occur and a patient begins to lose weight and become dehydrated, dietitians can boost fluid intake by offering soups, gelatin, ice cream, and popsicles between meals and during social activities. In some cases, changing the way beverages are presented (eg, via a cup’s edge or a straw) can make a big difference in whether a patient will drink them. Offering calorie-dense beverages, such as chocolate milk, and adding extra seasoning and butter to food can improve palatability and meal consumption in addition to providing the patient the necessary calories to promote weight gain. When food interventions are unsuccessful, RDs should provide supplements such as Ensure or Med Pass 2.0 to increase calorie intake between meals. These and other nutrition interventions require follow-up to determine whether the patient is accepting them. Making rounds at mealtimes and consulting with the health care team enables dietitians to determine a patient’s self-feeding abilities, ideal dining atmosphere, and degree of diet tolerance. This also helps gauge a patient’s appetite, meal intake, and preferences. A thorough nutrition assessment allows dietitians to make appropriate recommendations that ultimately lead to maintaining nutrition and hydration status and to improving dementia patients’ quality of life. — Laura Hilliard, MS, RD, LDN, CSG, CDP, is a clinical dietitian at Spring Gate Rehabilitation and Health Care Center in Memphis, Tennessee. She’s a board-certified specialist in gerontological nutrition, a certified dementia practitioner, and has served as the chair of the enhanced dining committee at Spring Gate. 1. What is dementia? Alzheimer’s Association website. http://www.alz.org/what-is-dementia.asp. Accessed May 17, 2013. 2. Keller HH, Gibbs-Ward A, Randall-Simpson J, Bocock MA, Dimou E. Meal rounds: an essential aspect of quality nutrition services in long-term care. J Am Med Dir Assoc. 2006;7(1):40-45.